Some time back, I saw the cutest sign on Pinterest that described our house perfectly! It was created by Shannon at Sweet Blessings . I pinned it to my Cricut Crafts Board fully intending to make it using the Cricut. But then, we spent last week in the hospital (the hubby had surgery) and I was playing around on PicMonkey (big surprise - right?) and came up with my own version. I'm a Copy Cat! But I hope Shannon agrees with me that "Imitation is the sincerest form of flattery". Check out Shannon's blog because she has the sign in all different colors and kinds of drinks along with lots of other great printables that she has designed. I found a package of 2 frames in this great turquoise color at Target sometime last year on the clearance shelf for $1.48 and knew they would be perfect for this. The bunting across the top is just 2 different strands of embroidery floss that I twisted together with little pieces of polka dot ribbon hot glued on to them. 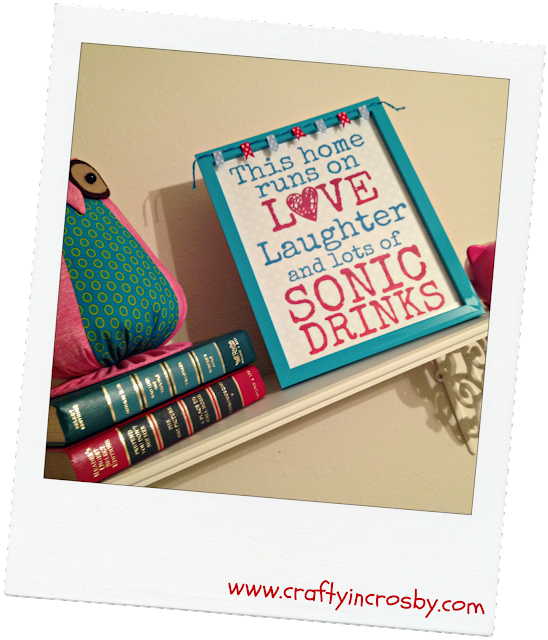 All my friends and family know that I have a serious Sonic Diet Cherry Coke addiction and will agree that this sign fits me perfectly! Thanks for dropping by to see us! This is adorable. I love the colors and the quote. Thanks so much for joining in on the fun copy cat challenge party. Enjoy! Thanks for hosting! I saw the party and went back to my post and added the Copy Cat! Adorable! Pretty colors and I love the frame! Thanks for sharing at the Pomp Party! Pinning to our Pomp Party board! Thanks Jillian! And thanks for hosting the Blog Walk! I'm meeting lots of great bloggers through it. That sign is so cute and full of possibilities! 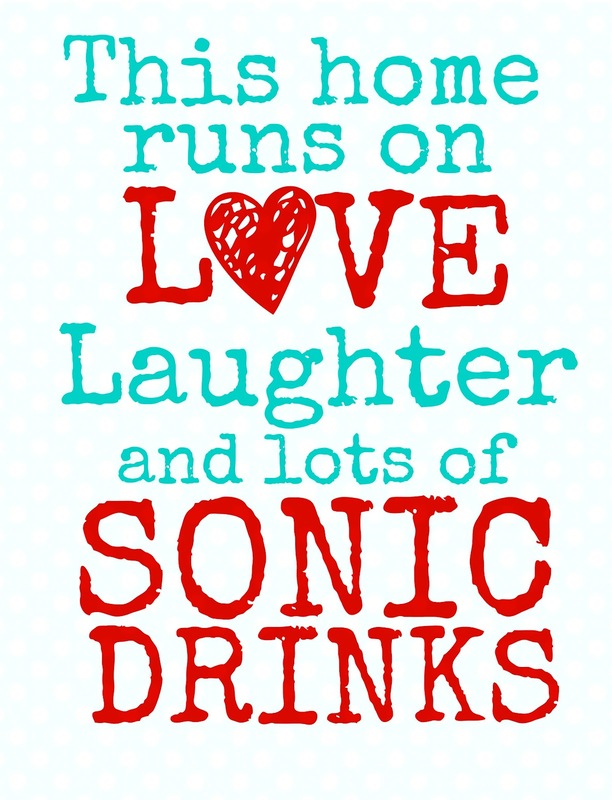 You could substitute Sonic for Starbucks, Chardonnay, Chocolate! The choices are endless! For me, it would be appropriate to use "cat hair" since I have so many of those critters! Thanks for sharing and thanks for your sweet comment about my chair. You'll be the first on the list when I gift it away! Thanks for dropping by Jaye. Love the idea about the cat hair! I'm going to have to make one for Leigh with that saying on it. She spends endless amounts of time with a lint roller because of her kitty! We just picked up 3 chairs off the curb and I think I'm going to paint one of them just like yours! love the color combo in that frame! just found your blog from the weekend hop and excited to be your newest follower! p.s. I'd love for you to drop by lavitaebella-elisabeth.blogspot.com when you get a chance and say hi! Thanks so much Elisabeth! I'm your newest follower too! Thanks for stopping in and following us! I'm your newest follower too! Hello, I love the sign. For my house it's coffee and I think I will have to make one for my front door. It is amazing what you can find that people have created. Awesome. I'm a new follower. Have a great weekend. Thanks Austin! I get most of my ideas on Pinterest. 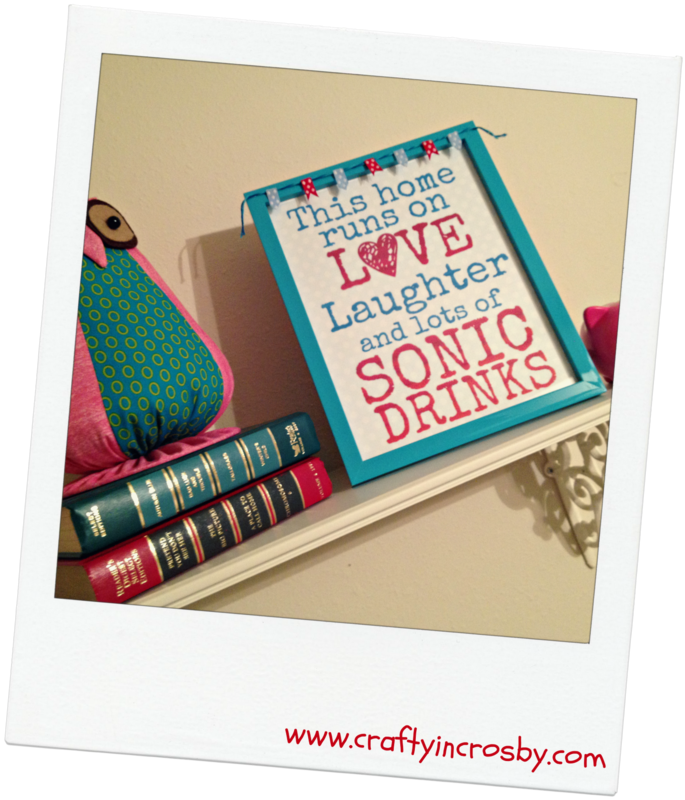 You could easily make this sign in PicMonkey with whatever your favorite beverage is. I'm following you now too! So cute! 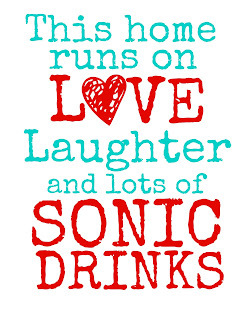 I've been to Sonic once and I had a drink there, don't remember which one but I do remember it was so good. I haven't tried using PicMonkey for signs before, it's a great idea. Thanks for sharing on my Our Favorite Things Link Party. There are lots of great tutorials on Pinterest on how to use PicMonkey to create your own signs and even blog buttons. I really love it and it is super easy to use. Can't wait to see what you create! Just stopping by from the Marvelous Monday blog hop. I am your newest GFC follower. I love this sign. I subsist on cherry cokes and slushies from Sonic. Thank Melissa! I'm your newest follower too! My addition is Diet Cherry Vanilla Coke! Oh my goodness, I love my Cherry Limeades! And this printable! I'd love for you to link this up to my link party!! Thank for the invite Kathryn! I linked up and am your newest follower! Carole, Thanks for dropping by! I'm following you back too. Looking forward to enjoying Food on Friday! I used to work at sonic in high school, and now I absolutely feel like this is the best thing ever!! I love the little owl that your Mother-In-Law made for you! Everything looks so color perfect on that shelf! I love that saying! It reminds me so much of my cousin and her family. They almost always have a Sonic drink in hand. Too funny! too fun! love the colors too! This is very cute! Thanks for sharing on Marvelous Mondays! What a cute little sign! How cute! Thanks so much for linking up to our Pinteresting Party! Very cute! I am following you now from the weekend blog hop. 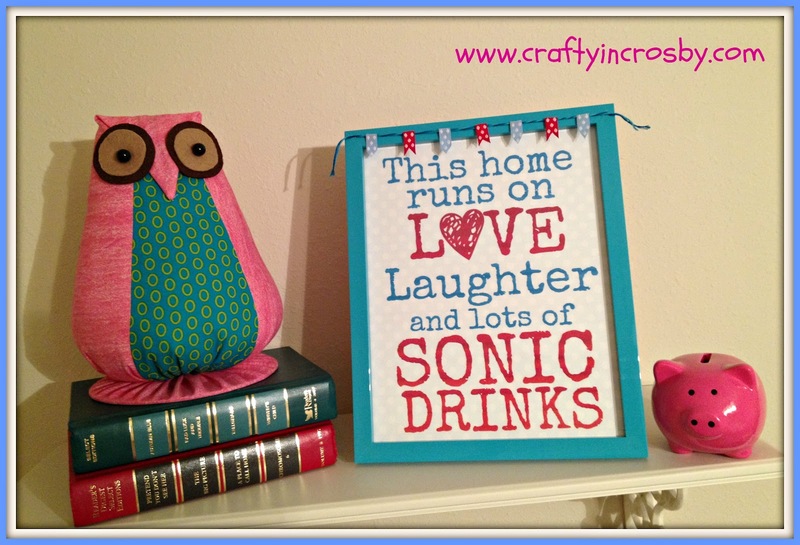 Come link up and paticpate in my craft challenges each week. Thanks so much for the follow. 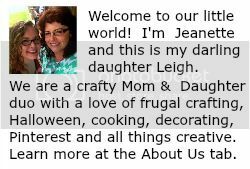 I'm following you now too and look forward to the next craft challenge! Such a GREAT sign!! Love the printable! I love this though in our house you would need to change it to caffeine! Thanks for sharing on Tout It Tuesday. Hope to see you tomorrow. 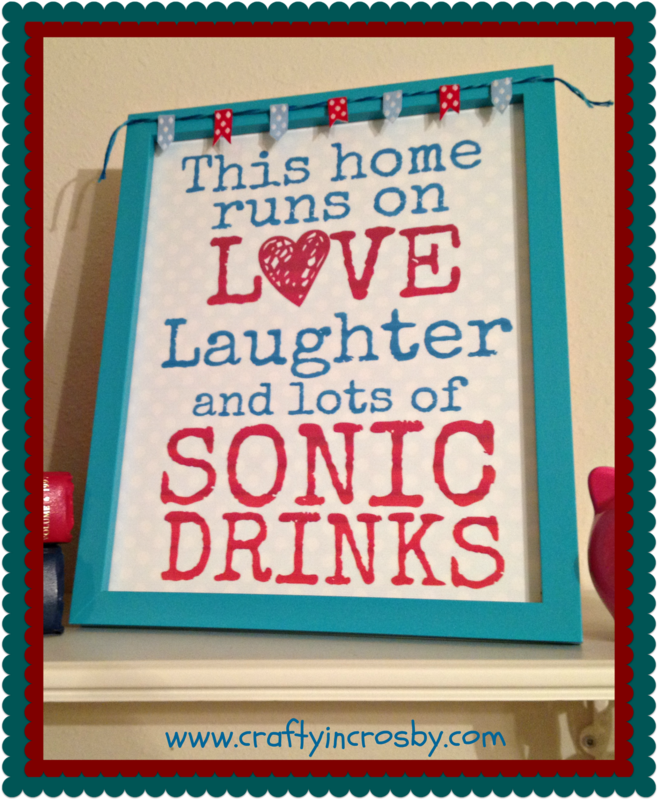 my kids know if we are ever out and about between 2 and 4, we are heading to Sonic! Featuring this today at the link party :) Thanks for linking up!